The Venezuelan national assembly took up debate on Internet regulation Tuesday, just days after President Hugo Chavez called for online restrictions in televised remarks. Lesley Enriquez went to a birthday party and brought her husband and baby daughter along. After the food and cake and singing and children's games were done, the family piled into the car and headed home. Honda recalls 400,00 vehicles for brake: Honda said Tuesday it is recalling more than 400,000 vehicles in the United States after consumers complained of brake pedals feeling "soft." African teen king lives dual life: At first glance, he looks like any other 17-year-old. Jackson estate signs record deal with Sony: The administrators of Michael Jackson's estate and Sony Music Entertainment said Tuesday that they have reached a deal concerning the sale of the late singer's recordings. Driver slams into rock slide: A driver runs into rock slide debris on a portion of U.S. Highway 129 in Tennessee known as "The Dragon." Facebook traffic tops Google for the week: Facebook topped Google to become the most visited U.S. Web site last week, indicating a shift in how Americans are searching for content. From stranded on a sandbar to slippery ice floes, animals found themselves in precarious positions, and people went above and beyond to save them. Filed under: Animals • U.S.
A Chicago man charged in two international terror plots is expected to change his plea to guilty, according to his lawyer. David Headley has been in custody since October and is charged with scouting targets for the 2008 Mumbai, India, terror attack and with a plot against a Danish newspaper that published cartoons depicting the Prophet Mohammed. [Posted, 8:03 p.m.] The mostly Shiite Iraqi National Alliance was ahead in three provinces, according to the electoral commission. The coalition is backed by the country's predominantly Shiite neighbor, Iran, and includes controversial secular politician Ahmed Chalabi, as well as some of Iraq's top Shiite religious parties - including followers of radical anti-American cleric Muqtada al-Sadr. An alliance of Iraq's major Kurdish parties led in the three majority-Kurdish provinces in northeastern Iraq. [Posted, 6:48 p.m.] Former Iraqi Prime Minister Ayad Allawi's bloc edged ahead of the coalition led by Prime Minister Nuri al-Maliki in the latest results from Iraq's parliamentary vote, election officials announced late Tuesday. Somalia's president called a new alliance between a rebel group and the country's government "a historic success" and said Tuesday that it marked a closer step toward recovery for the failed state. The peace agreement between the government and the Ahlu Sunnah group was signed Monday night at the headquarters of the African Union in Addis Ababa, Ethiopia, according to the United Nations. The Obama administration's decision on where to try the self-proclaimed mastermind of the 9/11 terror attacks will be made "within weeks, not months," Attorney General Eric Holder told a House panel on Tuesday. And although Holder conceded "the train may have left the station" on a decision to hold the trials in New York City, he continued his dogged defense of the need to try terrorist defendants in civilian criminal courts. Stocks rose Tuesday after the Federal Reserve voted to keep interest rates at historic lows and Standard & Poor's did not downgrade Greece's credit rating. The Dow Jones industrial average was up 35 points, or 0.3 percent, at with about 1-1/2 hours left in the session. The S&P 500 index rose 7 points, or 0.6 percent. The Nasdaq composite gained 14 points or 0.6 percent. Is the Masters the right venue for Tiger's return? Tiger Woods announced this morning that he’d make his return to golf at the Masters in April. Woods has been away from the tour since he crashed his vehicle into a fire hydrant and then a tree near his home late last year. “Tiger Woods will play the Masters. Well, of course he will. The story had to end up at the Masters. There were people who thought that he might play Arnold Palmer's tournament at Bay Hill next week or he might wait until later in the year to enter a tournament,” he writes. Iranians marked a holiday that leads up to the Persian new year under the watchful eyes of police Tuesday night after the Islamic republic's supreme leader tried to discourage the celebrations. 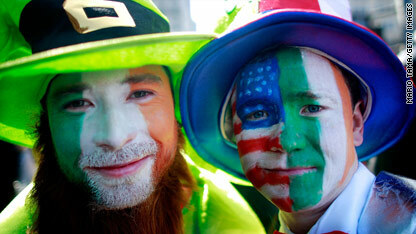 New York City will host its 248th annual St. Patricks Day Parade. There's a parade in New York City, and Ireland's Taoiseach - or prime minister - Brian Cowen will be in Washington. Cowen and his wife will have a traditional Irish breakfast with Vice President Joe Biden before meeting with President Barack Obama, and presenting the U.S. leader with a traditional shamrock. [Update 4 p.m.] Israel's delay in responding to a U.S. request to demonstrate its commitment to the peace process has contributed in part to a delay of proximity talks to be led by former Sen. George Mitchell, the Obama administration's special envoy to the Middle East. United Nations Secretary-General Ban Ki-moon expressed his own call of condemnation Tuesday in response to Israel's recent announcement that it plans to construct new housing settlements in contentious East Jerusalem. Ireland's top Catholic cardinal is using the "Nuremberg defense" in the face of public outrage at his role 35 years ago in investigating one of the country's most notorious child-abusing priests, an activist said Tuesday. A man who used to teach at a Roman Catholic religious order's schools in Spain has been arrested in Chile on suspicion of sexually abusing children, police in Spain and Chile said Tuesday. Thousands of Nigerian youths took to the streets Tuesday in a rare display of public anger over issues ranging from infrastructure failings, fuel shortages and power blackouts that reflect growing pressure on the country's ailing president. Honda said Tuesday it is recalling more than 400,000 vehicles in the United States after consumers complained of brake pedals feeling "soft." The Federal Reserve left its key interest rate near 0% once again Tuesday and said rates should stay this low for the foreseeable future.